UPPER EAST SIDE — Residents living amid the drilling and blasting for the Second Avenue subway say they’re developing coughs, they can’t open their windows or go outside for part of the day and they have to sweep their apartments often because of dust buildup. 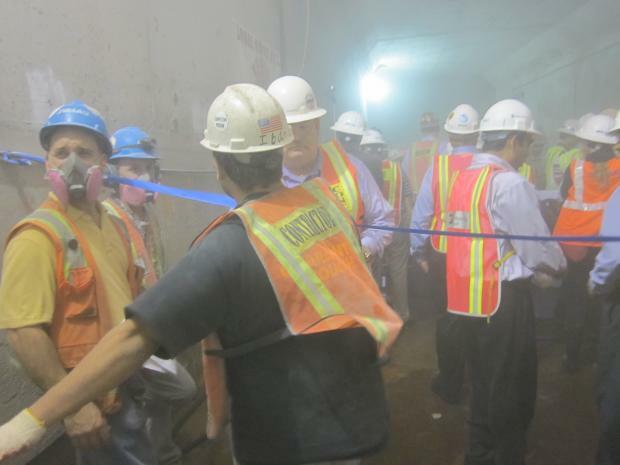 They're blaming the construction's plumes of dust and noxious odors, and shared their complaints with MTA officials at a heated and emotional meeting Monday night convened by Community Board 8's Second Avenue Subway Task Force where the transportation agency shared preliminary findings from an air quality study they’re conducting in 10 locations between East 69th and 87th streets. "There’s no way to cross the street without getting covered in muck," said Valerie Mason, who lives on East 72nd Street. "There are elderly and children and they are in the middle of a construction site. It’s just not right." The MTA's preliminary findings, however, suggested that residents should be more concerned about pollution from morning rush hour traffic than dust from blasting, MTA Capital Construction President Michael Horodniceanu told residents. In response to these long-standing community worries, the MTA hired Guido Schattanek, senior environmental engineer at Parsons Brinckerhoff, to conduct an independent study of the dust particles from the excavation, blasting, demolition and diesel truck engines at the site. The four-week study, which is collecting more than 100,000 daily data points of particulate matter, silica, carbon dioxide and ammonia, began on Sept. 11 and will last through Oct. 8. After roughly three weeks for analysis, a draft document will be sent to the MTA and other agencies and will be peer reviewed by the U.S. Environmental Protection Agency. Schattanek presented data collected from the first week showing that particulate matter starts its upward ascent at 6 a.m. and hits its peak around 9 or 10 a.m. — during the morning rush hour. The data showed another peak around 4 p.m., when construction crews were blasting, but that peak was smaller than the one earlier in the day. "You should be as concerned about traffic as anything else,” Horodniceanu said pointing to the preliminary results. When residents asked why there wasn’t a corresponding peak in the evening rush, Horodniceanu — a former traffic commissioner — explained that the evening rush is much more diffuse, with people leaving at different times, and does not include the many truck deliveries that occur during the morning. Many also criticized the agency for waiting so long to conduct such an environmental study. “We have never believed nor do we believe at this time that we’re creating a health hazard to the residents, businesses and people in the area,” Bill Goodrich, senior vice president at MTA Capital Construction, told residents. “I could see it could shake you,” Schattanek said, “and we’re trying to see if there are more long-lasting effects. The main way to control the dust, he said, is to hose it down with water. He said the study would provide information about whether the MTA needs more hosing at the sites. Residents asked if they should keep their windows closed and stay inside during blasting.